BMW brings some pretty big changes to their flagship supersport. The production model of the 2019 BMW S1000RR has finally been unveiled and it surpasses our expectations in almost every front. The bike has the same tech specs that were leaked a few days ago, yet in the flesh, the 2019 BMW 1000RR is a beast with unparalleled charisma. The bike has a lot of mechanical, cosmetic and design changes. As a result, they change the way in which the new model looks and functions. Starting with the engine, the 2019 BMW S1000RR comes equipped with a 999cc, liquid cooled, inline-4 cylinder engine. It is equipped with the company’s ShiftCam system which increases power across the entire rev range. Thus supplying the bike with a good low-end torque and midrange along with a furious top end. The engine produces 207 BHP at 13,500 RPM and 113 Nm of torque at 11,000 RPM. To summarise, 0-100 km/hr is possible under 3 seconds and the top speed is 299 km/hr. The next big change is in the design of the bike. The asymmetrical design has been replaced with twin symmetrical LED lights. The frame is exposed in the centre. The new design looks sharp and sleek, although the old lights were kind of legendary, the new ones will also turn heads. The riding position on the bike is more track focussed courtesy of a longer swingarm and steeper rake. The tail of the bike is also redesigned and features LED lights. The turn signals also see a switch to LED. The electronic package has almost everything that you might need. 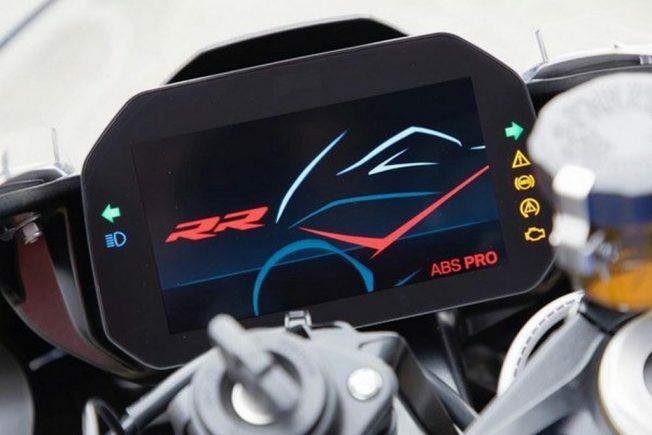 The bike comes with BMW Motorrad ABS pro, digital traction control, hill start control along with four riding modes (race, road, dynamic, race). The gearbox allows bi-directional clutchless shifts. The gear shifter works like a quick shifter during upshifting but during downshifts, the ECU blips the throttle. All the functions can be managed by a coloured TFT screen which acts as the instrument console. Dimensions wise, the bike has a pretty manageable weight of 197 kg. It comes with a 16.5-litre fuel tank which should be enough considering the ShiftCam will also help in improving fuel economy. The seat height is increased to 824 mm, which is a good news for taller riders. Also, the new fairing design ditches the old shark-type gills and adopts a more open structure. However, there is still space near the tank for the rider to easily tuck in. Overall the 2019 BMW S1000RR is a worthy upgrade from the last gen and the company absolutely nailed almost every aspect of the bike.